While researching humidifiers for other recent posts, we at Home Health Living kept coming across Air O Swiss humidifiers. They’re a popular and in-demand brand and have a range of different models of ultrasonic warm or cool mist humidfiiers. Air O Swiss has been a well-known humidifier brand for many years, and has been in operation since the 1950s. But Air O Swiss and Boneco have joined forces and are now collectively known as Boneco Healthy Air. 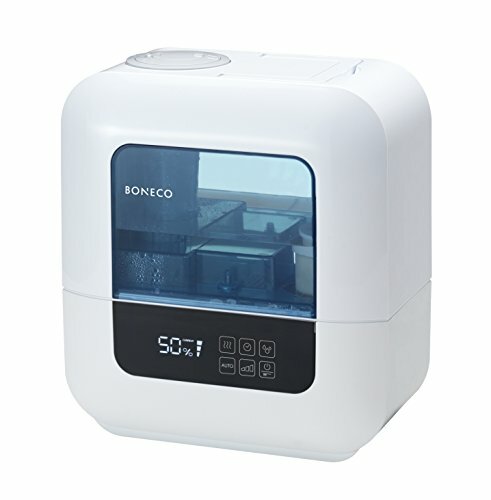 So if you have been searching for an Air O Swiss humidifier and are wondering why you can’t find them, it’s because they are now referred to as Boneco humidifiers. 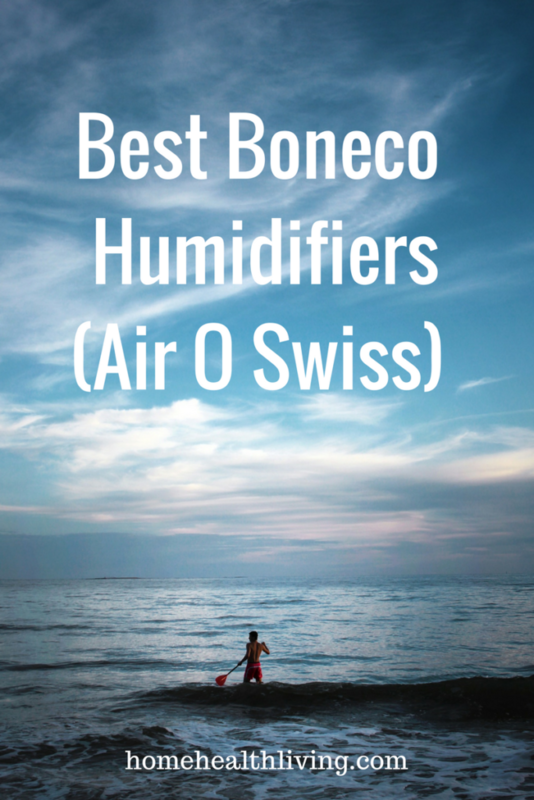 We’ve researched all of the Air O Swiss/Boneco humidifiers on the market and have reviewed each one, to help you choose the best Air O Swiss (now Boneco) humidifier. For the remainder of our post, to avoid confusion, we will refer to Air O Swiss humidifiers as Boneco humidifiers. Because there are many different Boneco humidifier models, we have also created a comparison table so that you can easily see the different features of each of the models. This will help you choose the best ultrasonic humidifier to buy. The Boneco Warm or Cool Mist Ultrasonic Humidifier U700 is a smart and innovative humidifier with high output levels, advanced cleaning features and a modern, sleek design. Being an ultrasonic humidifier, it creates high frequency vibrations that turn water molecules into a fine mist ready for dispersion. One of the things we love about the Boneco Warm or Cool Mist Ultrasonic Humidifier U700 is that it has the largest water tank and highest level of humidity output of any Boneco/ Air O Swiss humidifier. The water tank holds 2.4 gallons (around 9 litres) of water and its output level is up to 4 gallons (around 15 litres) per 24 hours, and is suitable for use in rooms up to 1000 square feet in size. You can choose whether the U700 releases a warm or cool mist, and the Auto Mode uses a programmable hygrostat so that the humidifier can adjust its output according to the humidity readings of the room. Some users of the U700 mentioned that the hygrostat is inaccurate. If an accurate humidity reading is important to you, then we recommend you look at purchasing a digital hygrometer such as the ones we reviewed in this post. The water tank has handles and is easy to remove, which helps when refilling with water. When the tank is removed, the unit automatically shuts off. There is also a fragrance container within the unit so that you can add your own favorite essential oils, turning the humidifier into an essential oil diffuser as well. The digital display allows you to select an auto-dimming function, as well as displaying reminders for when to clean the unit and when to refill the water tank. There are 2 performance levels available, as well as a Sleep Mode which offers a whisper-quiet performance, making this a perfect humidifier for baby room use or for those who don’t like noise at night. The U700 also has a timer function, a double jet nozzle for effective mist dispersion and a soothing LED light (with the option to switch it off). The digital display light cannot be switched off but can be dimmed. The Boneco warm or cool mist ultrasonic humidifier has advanced cleaning features, making it a humidifier that has high cleanliness standards. During the Cleaning Mode, the U700 loosens built-up scale, making it easier to clean the unit. It comes with essential accessories for cleaning and maintenance, including a hydro cell (to maintain freshness), a demineralization cartridge and EZCal to reduce lime scale and mineral residues. The demineralization cartridge helps prevent the release of minerals in the air, which is the cause of white dust in a room after using an ultrasonic humidifier. The hydro cell is essentially an activated carbon filter that works to keep the water filtered and fresh. There is a 3-year limited warranty available. The Boneco Warm or Cool Mist Ultrasonic Humidifier U650 model is an effective humidifier for those wanting to be able to choose between the warm and cool mist options. Its water tank has a capcity of 1.5 gallons (just over 5 litres) and its level of output is 3.5 gallons (13 litres) per 24 hours, and is suitable for rooms up to 650 square feet. You can choose the level of output via the output control function. There are 3 performance levels. There is a fully automated operation available by selecting the Auto Mode, which allows the in-built hygrostat to measure the humidity level in the room and adjust the humidifier’s output accordingly. The U650’s digital display features a display dimmer, great for those who don’t like bright lights at night. The Sleep Mode also reduces the level of noise. It has a sleek design, with surface touch buttons. There is also an empty indicator that shows you when it’s time to refill the water tank. There are also reminders on the display for when cleaning is required. You can select a warm or cool mist- some prefer the cool mist option during the summer months. The mist is dispersed in two directions via the double jet nozzle, to ensure an even spread of mist in a room. Like all other Boneco humidifiers, the U650 comes with the required maintenance accessories. The demineralization cartridge removes minerals in the water, prevent the white dust most people find annoying when using an ultrasonic humidifier. The cartridge needs to be replaced every 2 to 3 months, depending on the quality of the source water. If you are using hard water, then you may need to replace the cartridge more often. The Hydro Cell is an activated carbon filter that helps to keep the water clean and filtered, which prevents the growth of mold and bacteria. It needs to be replaced every 1 to 2 months, depending on the quality of the source water. The EZCal cleaner is a cleaner and descaler product that includes 3 individual packets in the one box. One packet is used per clean, and it’s recommended that you descale the unit every fortnight. The Boneco Warm or Cool Mist Ultrasonic Humidifier 7142 model is a great choice for those needing a humidifier designed with space-saving features. What we like about the design of the Boneco 7142 is that it’s a stylish tower design- so it is not as wide as the other Boneco humidifiers. The 7142 is a great space saver, but also has a large water tank capacity so that it’s suitable for a large room. It has a capacity of 2 gallons (7.5 litres) and its level of output is 3.5 gallons (13 litres) per 24 hours. 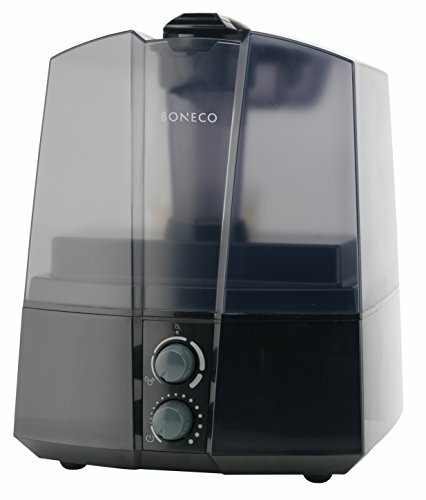 This particular Boneco model humidifier is suitable for rooms up to 860 square feet. The self-explanatory LED display features a number of options, include the choice of cool or warm mist, as well as displaying reminders for refilling the water tank and cleaning the unit. There is a programmable hygrostat, which allows you to choose the Auto Mode. During Auto Mode, the unit takes a reading of the humidity level in the room and uses this reading to control the output of the mist. There are 3 performance levels available with the Boneco 7142, and there is a double jet nozzle to ensure a more even spread of mist in the room. For those who don’t like noise or light at night, there is a Sleep Mode. The Sleep Mode reduces the level of noise coming from the humidifier. There is also a timer function so that you can set how long you want the humidifier to operate for. Cleaning the Boneco 7142 is fairly easy. It is easy to handle and clean, and the unit comes with a cleaning brush included. You also receive a Hydro Cell and a demineralization cartridge. The Hydro Cell keeps the water filtered so as to prevent mold growth. The demineralization cartridge helps to remove minerals from your water, so that you don’t end up with white dust around your room. This is a typical complaint from users of ultrasonic humidifiers. Boneco has recommended frequencies for replacing the Hydro Cell (every 1 to 2 months) and demineralization cartridge (every 2 to 3 months). 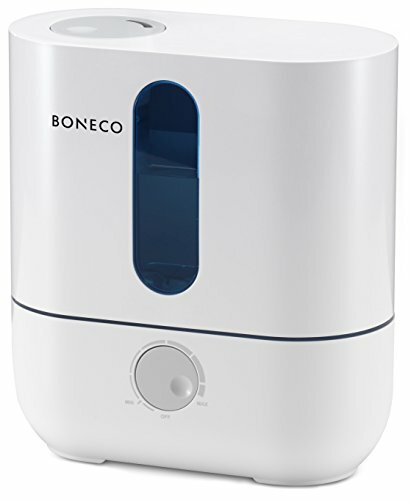 One of the most popular and highly-rated Boneco humidifiers is the Boneco Warm or Cool Mist Ultrasonic Humidifier 7147 model. It is typically used in either homes or offices and is an effective humidifier suitable for rooms up to 600 square feet. Its water tank capacity is 1.5 gallons (5.6 litres) and it has an output level of 3 gallons (11 litres) per 24 hours of use. You can choose whether you want the humidifier to disperse warm or cool mist. Some people prefer to use the warm mist function during the winter, especially if the humidifier is for baby room use. This helps to maintain the temperature in the room. 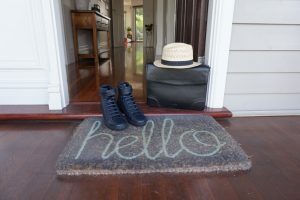 During the hotter months, you can choose the cool mist option instead. There is a built-in hygrostat that allows you to set your desired level of humidity, and the humidifier will stop once the desired humidity level is reached. 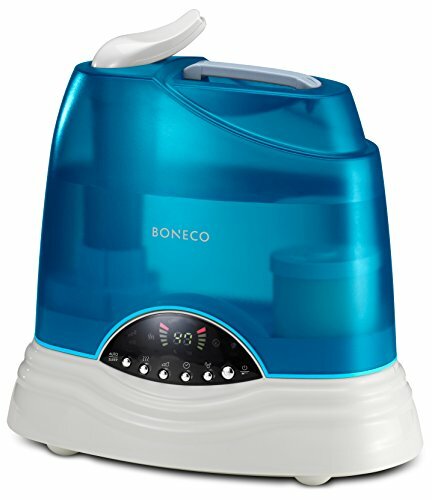 The Boneco 7147 humidifier has a double jet nozzle to help disperse the mist more evenly. There is a multifunction display on the unit. Once the water tank is empty, there is an indicator light on the display to let you know that it’s time to refill the tank. There is also an indicator that reminds you when to refill the water tank and when to clean the unit. The display allows you to select one of 3 performance levels, and there is a Sleep Mode that reduces the noise from the unit. This is great for those who don’t like much noise when sleeping. You can also set a timer using the timer function. The Boneco 7147 also as an Auto Mode function where the humidifier operation is fully automated. For cleaning purposes, the unit comes with cleaning accessories. The Hydro Cell, which is an activated carbon filter that filters the water to prevent mold and bacteria growth. Boneco recommends to replace the Hydro Cell every 1 to 2 months. The deminzeralization cartridge stops the release of minerals found in water into the air. This helps with reducing the incidence of white dust appearing in your room, which is typical of all ultrasonic humidifiers. The EZCal cleaner and descaler helps remove scale in the unit. It is recommended to be used every fortnight. There are 3 packets in each box, and one packet is required for each use. Another very popular and well-rated Boneco humidifier is the best-selling Boneco Warm or Cool Mist Ultrasonic Humidifier 7135 model. It has a design typical of many popular humidifiers on the market, with a blue-colored transparent water tank. The Boneco 7135 has an optional cool or warm mist function, so that you can choose the type of mist that you prefer. Most people choose the cool mist during the warmer months while use the warm mist during the colder months. The water tank has a large capacity of 1.75 gallons (6.6 litres) and has an output level of 3.5 gallons (13 litres) per 24 hours of use. 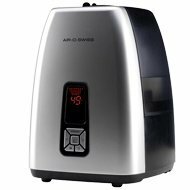 This makes the Boneco 7135 humidifier suitable for rooms up to 650 square feet. There is a programmable hygrostat so that you can choose what level of humidity you prefer in the room. The LED display is very easy to understand. It includes multifunction options such as reminders for when you need to refill the water tank and when the unit needs to be cleaned. The Boneco 7135 has 3 performance levels. It has an Auto Mode which uses auto mist technology for a fully automated operation without you needing to set your desired humidity level. You can also set a timer on the humidifier using the timer function. If you are someone who doesn’t like much noise at night, you can choose the Sleep Mode. This reduces the level of noise from the humidifier and will help you sleep better at night. 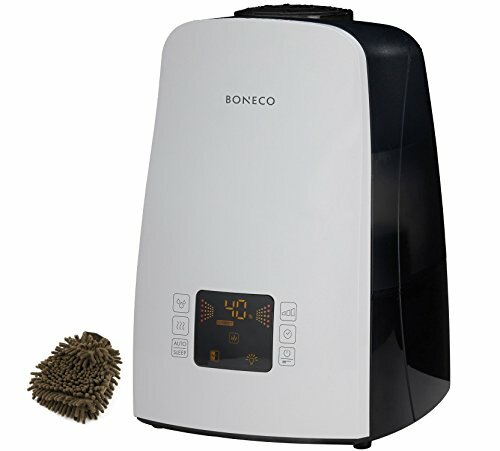 Cleaning the Boneco humidifier is easy, and comes with cleaning accessories such as a cleaning brush, a Hydro Cell, a demineralization cartridge and EZCal descaler. The Hydro Cell is an activated carbon filter product that helps to filter the water in the tank to prevent mold and bacteria growth. Boneco recommends that the Hydro Cell be replaced every 1 to 2 months depending on the source water quality. The demineralization cartridge helps prevent minerals in the water from being dispersed in the air- this prevents the common complaint of white dust in a room after using an ultrasonic humidifier. Boneco recommends that the demineralization cartridge be changed every 2 to 3 months, depending on source water quality. The descaler comes in a box containing 3 packets. It is recommended that the descaler be used once per fortnight, with one full packet required per use. The Boneco Warm or Cool Mist Ultrasonic Humidifier 7144 is a sleek-looking humidifier suitable for home or office use. It has an industrial, modern look. There is a warm mist or cool mist function available, depending on your personal preferences. You can choose the warm mist option during the colder months, and the cool mist option during the warmer months. The Boneco 7144 water tank has a capacity of 1.5 gallons (5.6 litres) and has an output level of 3.5 gallons (13 litres) per 24 hours of use. It is suitable for rooms up to 650 square feet. There is a double jet nozzle, so that the mist is dispersed in two different directions. The LED multifunction display is very easy to understand, and features practical reminders for when to refill the water tank and when it is time to clean the unit. There are 3 performance levels you can choose, and also an auto mist Auto Mode function that allows the humidifier to operate automatically. The Boneco 7144 includes a programmable hygrostat so that you can choose your desired level of humidity in the room. One of the things we like about the Boneco 7144 is that there is a timer function. This is great if you are using the humidifier in an office, because you can set the timer to stop the unit at the end of the working week. This means you don’t need to remember to switch it off before the weekend! For those using the humidifier in a bedroom, there is a Sleep Mode available, that reduces the noise emitted from the unit. Cleaning and handling the unit is very simple. There is a cleaning brush to help you clean the unit. Also included are cleaning accessories. The Hydro Cell is an activated carbon filter that filters your water to prevent mold and bacteria growth. It is recommended that you change the Hydro Cell every 1 to 2 months. The demineralization cartridge helps to remove minerals in the water so that they are not dispersed into the air. Most ultrasonic humidifiers leave you with white dust around your room, which is very frustrating. However, the demineralization cartridge stops this from occurring. It is recommended that the cartridge be changed every 2 to 3 months. There is also an EZCal descaler included with the humidifier. One boxes contains 3 packets of descaler, and its recommended that you use the descaler once per fortnight. One full packet is required per use. If you’re looking for a cost effective and simplified ultrasonic humidifier, then the Boneco Cool Mist Ultrasonic Humidifier 7145 may be the best option for you. This is a cool mist humidifier- there is no warm mist option available. Operation is via a control knob that’s easy to use. There is an integrated hygrostat that allows you to set your desired level of humidity, and an indicator that lets you know when you need to refill the water tank. The water tank has a capcity of 1.35 gallons (5.11 litres), making this the smallest water tank out of all of Boneco’s ultrasonic humidifiers. 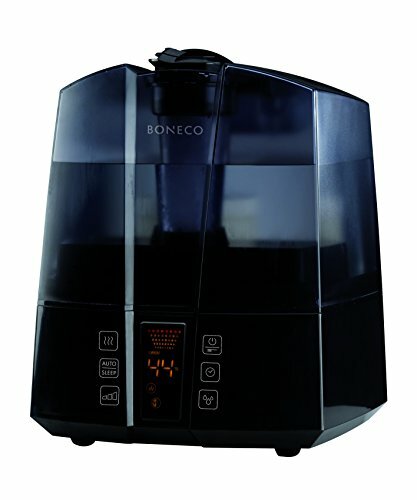 The output level is 2.5 gallons (9.46 litres) per 24 hours of use, making the Boneco 7145 humidifier suitable for small-medium sized rooms of around 540 square feet. Fortunately, you can regulate the output levels. There is a double jet nozzle so that mist is dispersed in two different directions in the room. The humidifier is easy to handle and clean. It comes with a cleaning brush, Hydro Cell, demineralization cartridge and EZCal descaler. The Hydro Cell is an activated carbon filter that prevents mold and bacteria from growing in the water. It’s recommended that the Hydro Cell be replaced every 1 to 2 months, depending on source water quality. The demineralization cartridge prevents the minerals in your water from being dispersed in the room. The great thing about this is that it prevents white dust in your room, which is a typical problem found with most ultrasonic humidifiers. Boneco recommends that you replace the demineralization cartridge every 2 to 3 months, depending on your source water quality. The EZCal scaler comes in a box with 3 packets. It is recommended that you use one full packet each time you descale the humidifier. It’s recommended that the humidifier be descaled once per fortnight to prevent lime scale build up. There is a limited 3-year warranty. A small room only requires a small humidifier, making the Boneco Cool Mist Ultrasonic Humidifier U200 a great choice. It’s water tank capacity is 1 gallon (3.78 litres), and its output level is 1.8 gallons (6.8 litres) per 24 hours of use. This makes the Boneco U200 a perfect choice for small rooms up to 430 square feet. 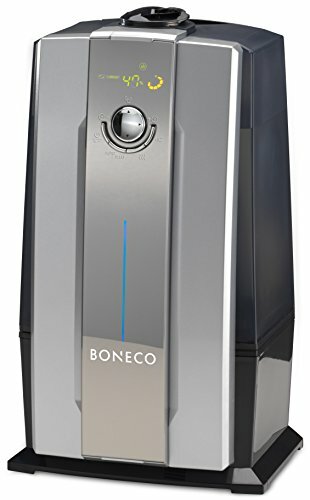 The Boneco U200 is a cool mist humidifier, so if you are concerned about using a cool mist humidifier during the colder months, this may not be the best option for you. However, if you are already using heating in your home, then using a cool mist humidifier should not make much difference to your room’s temperature. But, it is a personal choice! A smaller-sized humidifier means that the U200 uses half the power of its larger Boneco counterparts. It also makes the humidifier whisper-quiet: perfect for use in a baby nursery or toddler bedroom. So, if you’re wanting a small and easy to use humidifier and you are on a tight budget, the U200 would be a great Boneco choice. There is a dial control that’s easy to use, and the LED night light gives the room a soft glow. There is also a fragrance tray included so that you can use your favorite essential oils. The Boneco U200 is a Red Dot Design Award Winner. It’s easy to keep the U200 clean, as the unit comes with cleaning accessories. The Hydro Cell is an activated carbon filter that prevents mold and bacteria growth in your water. It is recommended that the Hydro Cell be replaced every 1 to 2 months. The demineralization cartridge helps eliminate the “white dust” problem found with most other ultrasonic humidifiers. This is because the cartridge removes minerals from the water before the mist is dispersed. It is recommended that the cartridge be replaced every 2 to 3 months, depending on the quality of your source water. The EZCal descaler is a box with 3 packets, and one full packet is required for each use. It is recommended that the unit be descaled once per fortnight. Many of the features of each of the Boneco humidifiers are the same. They all come with the same cleaning accessories, they all have built-in hygrostats and they have similar functions. Some of the models offer both the warm and cool mist option, while others only offer cool mist. The difference in pricing is due to the features of the humidifier. Those with more features and those that are a larger size tend to be more expensive. The water tank capacity differs from model to model. The amount that the water tank holds determines what room size the humidifier is suitable for. There are different humidifier models depending on the size of the room you are wanting to humidify. For larger rooms, you’ll need a model with a larger water tank capacity. The larger the humidifier, the higher the power consumption. The information in this post should make it easier for you to decide which of the Boneco humidifiers is best for your home needs. Just to recap, here is the comparison table again, to make it easier for you to make your choice and your purchase. Click on the product name to read more reviews or to find out the latest prices.